We have arrived at the date we have chosen to celebrate the centennial of our parish (1912 - 2012). 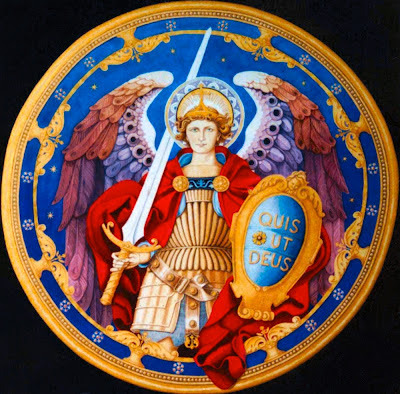 This is the weekend of the three Archangels: St. Michael, St. Gabriel and St. Raphael. Their feast day was yesterday, September 29. When we celebrate in the Church, we are really praying and not merrymaking as some do at a party. We are saying prayers of thanksgiving. Our gratitude is for having a parish, a church, where God’s grace is given to us in the Sacraments. We have a place where we gather to pray. We have a place where our souls are healed and strengthened. This is our place, our home, St. Michael the Archangel Church in Lyndhurst. We are also happy that our church is under the patronage of St. Michael. Angels are pure spirits who are ambassadors for God to men. An archangel has a critical mission, one which is crucial for the good of mankind. Michael, like the other archangels and angels, was free to say yes to God's will or to refuse it as the fallen angels did. We know that he happily conformed his will to God's, and that is fortunate for us. The name Michael comes from the Hebrew and means who is like God. In the Bible we learn that war broke out in heaven. St. Michael fought against the Satan and the other wicked angels who were eventually cast down to the earth (Rev. 12:7-9). Nevertheless, in spite of their defeat, the fallen angels continued to fight against the Church throughout the centuries. They will continue to do so until their definitive and final defeat at the end of time. We continue to intercede with our patron to protect us, our parish and the entire Church throughout the world. As we go into our next 100 years, may we imitate his humility, fidelity and obedience.